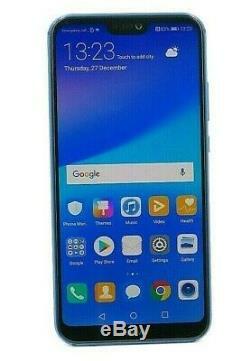 HUAWEI P20 Lite 5.8 64GB Unlocked Smartphone 4G - Blue / Black. Stunning photography with a dual lens camera. Take brilliant selfies with a 16MP front camera. 5.8 FHD+ display for a fantastic picture. Fast octa-core processor delivers smooth performance. 64 GB storage or up to 256 GB with a memory card. Then you'll love the Huawei. It's built for photography. It has a dual lens camera, so you get a 16MP and a 2MP camera on the back of the device. They work together to take images that amaze. A dedicated bokeh lens lets you create artistic shots, complete with blurred background effects. You can pretend you're an expert photographer, even if you're not. Nobody will know thanks to your professional-looking photos. A wide f/2.2 and f/2.4 aperture also lets you take great photos in dim lighting. So, don't let the dwindling evening light spoil a good photo opportunity on a night out. Make the most of it, and take photos not many other smartphones can. 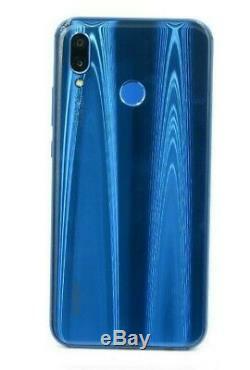 On the back is a 16MP selfie camera. Naturally it's a dab hand at portrait shots. It uses light fusion technology to capture brighter and clearer selfies in any lighting condition. In other words, you'll never take a bad selfie. The P20 Lite makes you look good without trying. Is a beautiful device with an all-glass design. It has a 5.8 FHD+ display that delivers brighter colours, and amazing detail. It's perfect for previewing all the photos you take with it, watching movies on the train, or playing the latest games from the Google Play Store. Has an octa-core processor and 4 GB of RAM, which makes it a smooth operator. You'll enjoy snappy performance that won't slow down over time. Your apps will open faster, and loading times will be quicker. 64 GB storage or up to 256 GB. That's plenty of room to store photos, apps, and movies. Then just insert a microSD memory card for up to 256 GB. That's so much storage, you won't even know what to do with it, but you'll have fun trying. 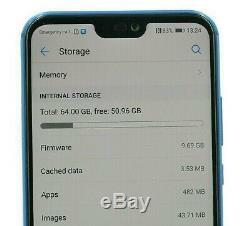 Technical specifications for HUAWEI P20 Lite - 64 GB, Black / Blue. HiSilicon Kirin 659 (2.2 GHz octa-core). MicroSD (up to 256 GB). 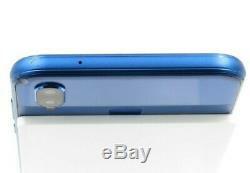 16 MP rear-facing - 2 MP rear-facing - 16 MP front facing. Full HD 1920 x 1080p. Augmented reality stickers - Wide aperture - Rear f/2.2 and f/2.4 aperture lenses - Front f/2.0 aperture lens. 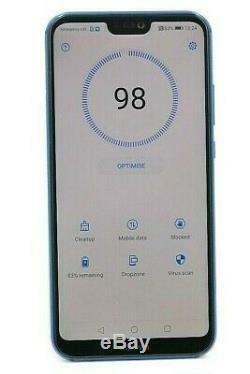 Huawei P20 Lite - 64 GB - Charger - SIM card removal tool - USB cable - Quick start guide. 148.6 x 71.2 x 7.4 mm (H x W x D). Until At least September 2020. New Other - Like New, Absolute Pristine condition. Grade A : Pristine condition - May have 1 or 2 Very Minor cosmetic Tiny Micro Surface scratches on the back casing or front - Any Scratches are usually confined to back casing and are only visible on close inspection. Grade B : Excellent condition - will have very light signs of use. 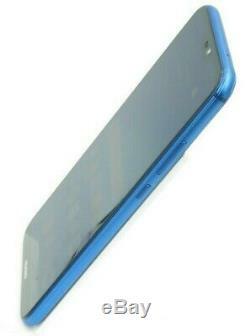 1 - 2 visible scratches on casing or display. Any display scratches are faint and will not be visible when the device is powered on. Grade C : Very Good condition - will have light signs of use. Visible scratches on casing or display. 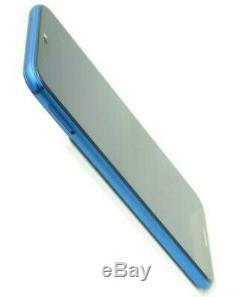 Scratches are usually confined to casing or edges and generally, screens are Excellent. Grade D : Good Used condition - will have signs of use. Heavier Visible scratches on casing & display. 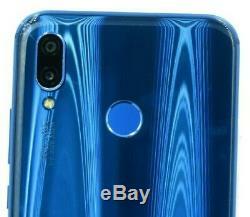 These Huawei P20 Lite Mobiles are excess retail stock units from a major UK retailer and are in various conditions ranging from New other (Absolute Pristine condition) down to Grade B (Excellent condition). The units come supplied In Huawei Retail Boxes with Genuine Huawei Wall charger & USB Cable. There maybe a service provider app installed but the devices are unlocked to any network provider. Q:How can I pay for my order? All items must be paid for prior to dispatch. Sutcliffe Jones LTD T/A Tech Wholesale UK is a UK based, VAT registered company, if you require a VAT invoice please message us and we will send you a copy separately. Re purchasing as we won? T be able to make amendments to the address once the order has been placed. At Tech Wholesale Uk we understand that sometimes our customers change their mind and need to return their handset. Which is extended to 30 days in the rare event thata handset develops a fault through no fault of your own. Please ensure that all accessories / Parts supplied i. Please note that the item is your responsibility until it is safely received by us. Get the all latest News, Updates and Special Offers about OUR STORE. The item "HUAWEI P20 Lite 5.8 LCD 64GB Unlocked SIM-free Smartphone 4G Blue / Black" is in sale since Thursday, February 14, 2019. 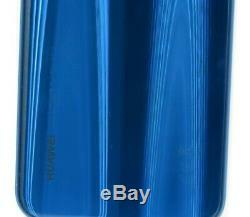 This item is in the category "Mobile Phones & Communication\Mobile & Smart Phones". The seller is "techwholesaleuk" and is located in Alloa.